This article is about Peach and Daisy's neutral special move. For information about the character, see Toad. Peach using Toad in Ultimate. 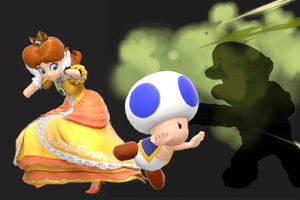 Toad (キノピオガード, Toad Guard) is Peach and Daisy's neutral special move. Peach pulls Toad out of hammerspace, and holds him out in front of her. Upon being hit, Toad will emit a damaging shower of spores. Unlike Roy or Ike's Counter which increases in damage when countering stronger attacks, Toad's spores do the same damage (3% each for a total of 18%) and knockback regardless of the power of the blocked attack. The spores themselves can be absorbed, and the move is in fact the only counterattack that fires projectiles when activated; this can be exploited by characters who possess reflectors with damaging hitboxes such as Mario or Fox, who can hit Peach with their reflectors in order to trigger her counterattack, causing her to get hit by the spores as a result of the reflectors continuing to remain active after initially hitting Peach. When using this move in midair, Peach will float upwards upon the first use which can be used to surprise an opponent. The move can be a bit difficult to use, as there is quite a bit of delay before Peach can block attacks, especially compared to other countering moves like Shulk's Vision or Marth's Counter. In Super Smash Bros. Ultimate, the animation is altered, as Peach now cowers while letting Toad protect her. Daisy's version is functionally identical, but uses a blue Toad instead of using the Toad himself. In this iteration, the move's startup is much faster, though it no longer stalls Peach in the air as long as it did in SSB4. "Use Toad as an unwilling shield. If he gets hit, he spreads spores." "A counter that puts opponents in front of you to sleep. Launches airborne opponents." "Not a counterattack. Releases spores that deal minor damage." Sleepy Toad: The move has marginally increased startup lag, and noticeably increased ending lag. Additionally, while Toad appears to stay out for the same period of time, the actual counter-armour window is shorter. However the move puts grounded opponents to sleep, with the duration increasing with the opponents percent, and this potentially enables earlier KOs by setting Peach up for a smash attack. Deals 3% damage. Doesn't float upwards as high as the default version when used in midair. Grumpy Toad: Toad no longer needs to be hit to use the attack, and will instead fire it regardless, allowing it to be used as a more conventional attack. However, the spores deal much less total damage (18% -> 8%), and lack the ability to kill at any reasonable percent. Additionally, the move has noticeably increased startup. Peach will not float upwards at all when she uses this custom move in midair. The move is unique to the Super Smash Bros. series, but the Toads are Peach's loyal servants in the Mario series, as well as the Mushroom Kingdom's dominant species. Toads dropping spores upon being hit was first seen in Mario Tennis upon completing a tournament with Toad. Toads appear in a variety of colors, blue included. Blue Toad is playable in New Super Mario Bros. Wii, New Super Mario Bros. U, and New Super Luigi U, and a separate blue Toad only named Toad is playable in Super Mario 3D World. Toads do not have any known direct affiliation with Daisy outside of her close friendship with Peach, but Toads can be partnered with her in various spin-off games, and if she defeats Bowser in Super Mario Run, she rescues Toad instead of Peach. Blue Toads were the color Toad that supported Daisy on her team in Mario Stikers Charged. Blue Toads can also be seen piloting Daisy-themed hot-air balloons on N64 Royal Raceway in Mario Kart 8 and Mario Kart 8 Deluxe. Peach using Toad in Melee. Peach uses Toad in Brawl. Peach using Toad in Super Smash Bros. for Wii U. Peach using Toad as shown by a Skill Preview in Ultimate. Daisy using Toad as shown by a Skill Preview in Ultimate. Early screenshots of the move sparked rumors that Toad would appear as a playable character. Size changing (from Super Mushrooms, Poison Mushrooms, and Special Smash) all affect Toad's size, though Metal Boxes do not affect his coloring, due to the fact that Toad is a separate model from Peach. In Smash 4, Toad is now metal if Peach is under the metal effect, though this no longer applies in Ultimate. This is the only counter move that is not a down special. However, the animations for the attack in Melee name it as "SpecialLw", implying it was originally going to be (with Vegetable's animations being named as "SpecialN"). As such, this is the only counter that Kirby can copy. Kirby's animations, curiously, still name the attack as "SpecialLw". Interestingly, Toad is referred to as “he” in Peach’s Move List, but is referred to as “it” in Daisy’s. The reason for this may be that the Red Toad has developed his own identity, but other colors of Toads are not as significant in the series, and are seen as a species rather than their own character. This page was last edited on April 23, 2019, at 15:03.